In February 2009, Andrew Witty, the Chief Executive of GlaxoSmithKline (GSK) announced that GSK would slash the prices of its medicines in low-income countries, and, more surprisingly, raised the idea of a patent pool, where holders of intellectual property rights would share discoveries in order to stimulate neglected diseases research (Lancet, 2009; McNeil, 2010). The announcement generated cautious praise from non-governmental organizations (NGOs) such as the Médicins Sans Frontières (MSF) and the Drugs for Neglected Diseases Initiative, the latter suggesting that GSK has emerged as the ‘most innovative’ pharmaceutical company to tackle the persistent problem of how to encourage the private sector to pour R&D funding into diseases that have little market value, as most sufferers are unable to afford the cost of treatments. This special issue emerged from a two-day symposium on ‘The Ethics and Politics of Neglected Disease Research,’ on 8–9 December 2008, funded and hosted by the Brocher Foundation in Geneva. 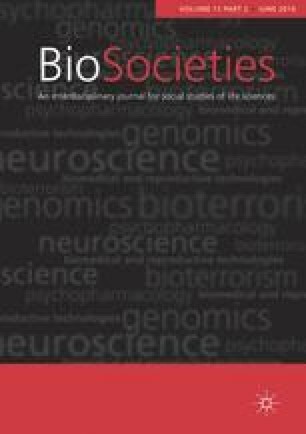 The guest editors would like to thank the Brocher Foundation, and the Editorial Board of BioSocieties, for their support. Benatar, S. (2009) Global health: Where to now? Global Health Governance 2: Online publication http://ghgj.org/benatar2.wherenow.htm. ClinicalTrials.gov. (2010) Paxil Japanese post marketing paediatric study in depression (double-blind, placebo controlled study), http://clinicaltrials.gov/ct2/show/study/NCT00812812, accessed 17 November 2010. Edwards, J. (2010) Glaxo is testing Paxil on 7-year-olds despite well known suicide risks. BNET, 21 May http://www.bnet.com/blog/drug-business/glaxo-is-testing-paxil-on-7-year-olds-despite-well-known-suicide-risks/4836. Fidler, D. (2008) After the revolution: Global health politics in a time of economic crisis and threatening future trends. Global Health Governance 2 (Fall 2008/Spring 2009), www.ghj.org. Lexchin, J. (2010) One step forward, one step sideways? Expanding research capacity of neglected diseases. BMC International Health and Human Rights, 10, http://www.biomedcentral.com/1472-698X/10/20. Taylor, L. (2010) German pharma price cut plans move closer Pharma Times. Pharma Timeshttp://www.pharmatimes.com/Article/10-11-15/German_pharma_price_cut_plans_move_closer.aspx. 15 November.